Freeriders, Expert Skiers, Intermediates, Snowboarders and Apres-Ski! The glaciated section of the Chamonix valley, historically linked to the famous resort. A small but attractive strung out village which suffers rather from traffic, but the skiing above is legendary and snow sure. When will it snow in Argentière? 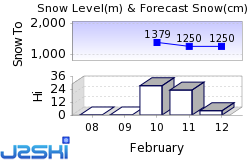 The next notable snow forecast for Argentière is 41cm16in, expected on 26 April, with around 101cm40in forecast over the next 7 days. The French Ski Resort of Argentière is part of the Ski Pass Mont Blanc area with access to 952km592 miles of downhill skiing, with 507 marked pistes, served by a total of 248 ski lifts. In addition to the skiing in Argentière itself (30km19 miles of pisted ski runs), the appropriate ski Lift Pass will allow you to ski or snowboard in the other Ski Pass Mont Blanc ski resorts of Chamonix, Combloux, Cordon, Le Tour, Les Contamines, Les Houches, Megève, Passy Plaine Joux and St Gervais Mont-Blanc. With ski lifts as high as 3,280m10,761ft, skiing and snowboarding is assured throughout the season. The most difficult run is the 'Pointe de Vue'. The Chamonix Mont Blanc Valley is an area synonymous with the best and most challenging in mountain sports world-wide and attracts the best practitioners of skiing, snowboarding, climbing and other disciplines each season. It attracts an even greater number of 'wannabes'. However, the resort is keen to point out that you don't have to 'live for skiing' to enjoy what Argentière has to offer: there are pisted trails for all standards. The terrain in The Grand Montets sector above the resort includes long, wide easy pistes for children and beginners; narrow and sloping combes for more advanced skiers and vast, wide long slopes for freestyle skiers or freeriders. Moguls form naturally on the la Herse or les Coqs pistes. There are endless off-piste ski routes to tackle with a guide. Starting from Les Grands Montets (3297 m) it's possible to ski right down to Argentière (1200 m), via the piste du Point de Vue or des Pylônes, then via the hotel Alternative and the Pierre à Ric, all part of Les Grands Montets with a vast number of alternatives are possible. You need to be in good physical condition to do the eight kilometre (five mile) descent over a 2100m vertical drop - one of the world's biggest lift served descents. The off piste descent on the Argentière glacier remains a great classic for advanced skiers, sweeping down between the seracs, turning in the Cordier couloir and discovering the Argentière massif, taking a guide is essential. 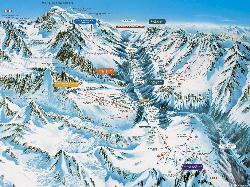 Advanced skiers can go to Montenvers from the Aiguille des Grands Montets to get to Chamonix. This route combines great curves on the vast slopes of the Pas de Chèvre, skiing on the Nant Blanc glacier, crossing the Mer de Glace and a descent towards Chamonix through the forest. Again, taking a guide is essential. Until 1996 the Chamonix Valley was one of the few remaining major ski areas to offer separate passes for different sectors of its skiing, but no whole-resort pass, unless you purchased the huge Skipass Mont-Blanc covering well over 230 lifts in a dozen or so neighbouring ski areas. This changed with the introduction of a range of 'Chamski' passes carefully tailored after extensive research to meet the needs of the diverse winter sports market. The basic six day pass includes a day over in Courmayeur, normally subject to a supplement, and two trips on the high Grands Montets lifts, again usually charged at an additional fee. The Grand Montets is a major part of the area's reputation and Argentière has the most direct access to it via the famous cable car. The skiable descent possible is from 3275 metres to 1230 metres and the world's record vertical in one day was set here by Canadian Mark Jones, clocking up 51 descents - a vertical of 64,000 metres (210,000 feet). Of the other famous sectors, L'Aiguille du Midi is perhaps the most legendary, with the famous 22km off-piste descent through La Vallée Blanche (take a guide!). Finally mention must be made of historic Le Brévent, where Chamonix's and one of the Alps' first real ski lifts was installed. The descent there is around 1500m. Argentière offers good sking, particularly, for Expert and Intermediate skiers. The Chamonix Valley has a reputation as the Freeriding Capital of Europe, whether on skis or board, and Argentiere certainly has plenty to entertain boarders of all abilities. There's a half pipe on Grand Montets and plenty of natural snowparks to entertain snowboarders. There are two terrain parks and another half pipe in the Chamonix area. We don't currently have confirmed season dates for Argentière. NOTE:- Lift and Piste openings are always subject to Snow Conditions in Argentière. The 10 ski lifts of Argentière are able to uplift 51,000 skiers and snowboarders every hour. Argentière is in the French Alps in Ski Pass Mont Blanc, Haute-Savoie, France. The nearest airports to Argentière are Sion, Geneva and Annecy. There are eight airports within three hours drive. Sion is just one hours drive away, in good driving conditions, so you can be on the piste quickly. There are a dozen or so bars in the village, popular choices include the Savoie Bar and Stones Bar. The Office is ever more popular, especially at Happy Hour. For something a little more sophisticated try the piano bar at the White Roc. If you want non-stop nightlife head down the road to Chamonix where there's a big choice and many establishments open to 4am. There's even a casino there if you want to boost your holiday spending money with a spectacular win on the gaming tables. Other Ski Areas within Ski Pass Mont Blanc. Other popular Ski Areas near Argentière. Popular Ski Areas in France. Want to ask about skiing and snowboarding in Argentière? Try our France Ski Forum. Or contact Argentière Tourist Office.